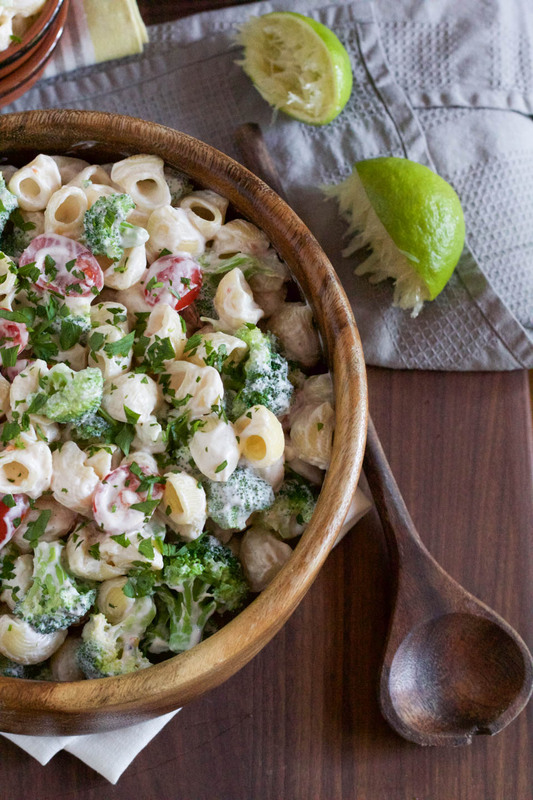 My all time favorite summer macaroni style salad is this Macaroni Salad with Yogurt Lime Dressing! It’s lightened up with a yogurt dressing and has tons of beautiful broccoli and sweet cherry tomatoes, sure to be a crowd pleasure. My Mama has been making this salad since I was born, no kidding. I remember eating this growing up every summer, as recently as last summer. I love it. It has some great ingredients that are familiar to my young palate, which is why I think I’m not a picky eater. I was eating green olives as a very young child. I asked her where she came up with it, and like most of her creations, she made them up. There may be inspiration from a tv show, movie, newspaper article, or magazine, but she does not follow recipes ever. It’s comical, she used to cut out recipes from everywhere for me, I mean hundreds of tiny cutouts for me to try. That is where her main inspiration comes from, but she’ll glance a it, and make it up as she goes. You could totally make a simple chicken, fish, flank steak, or grill up some sausage to go with this Macaroni Salad with Yogurt Lime Dressing for an easy meal, camping, or fun weekend gathering. Everyone who has had this macaroni salad loves it! Cook pasta according to the instructions on the package. While the pasta is cooking, place yogurt, mayo, lime zest and juice, pepper, and salt in a large bowl, whisk to combine. Add the cherry tomatoes, and olives, stir to combine. Remove pasta from the water using spider or slotted spoon, add to the large bowl with dressing. 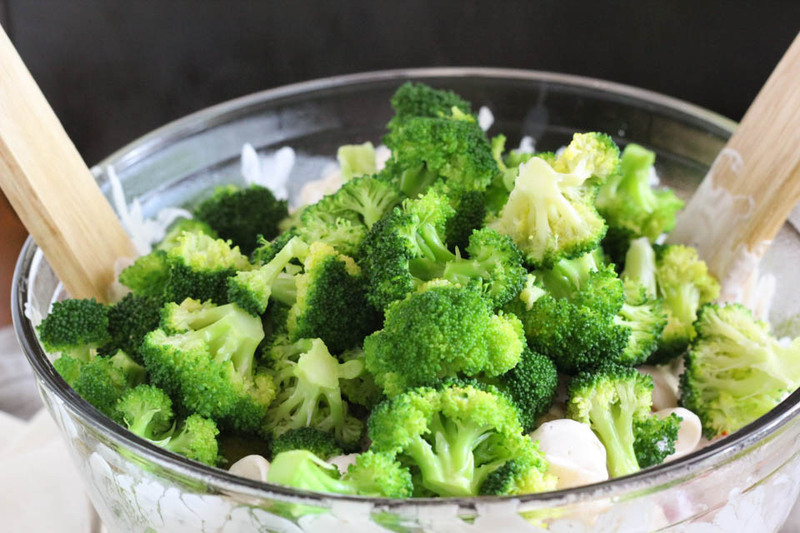 Place broccoli in pasta water for 30 seconds to 1 minute, or until bright green. Remove using spider or slotted spoon, place in bowl with ice water for a few minutes. Remove broccoli using spider or slotted spoon, place in bowl with pasta. Stir to combine, and place in fridge to cool completely for an hour or so. Remove from fridge, add parsley, stir to combine. Serve cold. This can be made one day in advance and store leftovers for up to 3 days in an airtight container. Tasty pasta dishes from NJB! Mmmmm this looks good. 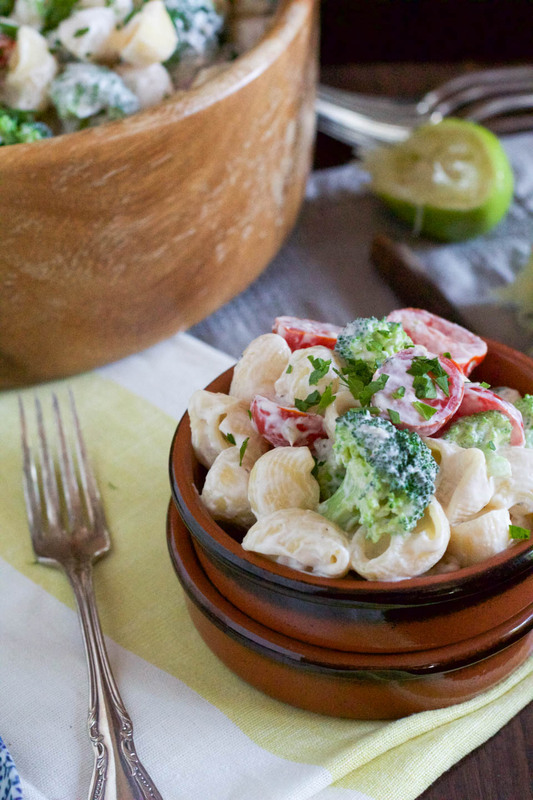 I usually add lemon to macaroni salad, but I love the idea of adding lime instead! Mmm I love a good pasta salad. Love this version with Greek Yogurt and cherry tomatoes, yum! Yes please! This is just what I want to eat when it’s too hot to turn on the oven. I would make a big batch and have it for lunch all week! Of course, it looks so good! And thank you, I hope you like it :).